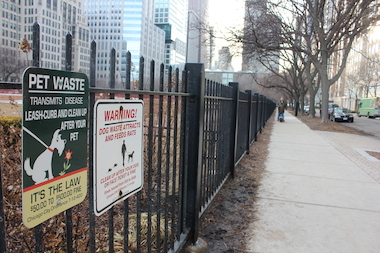 The Lake Shore Park Advisory Council said dog waste was popping up in sections of the park where pooches are prohibited. 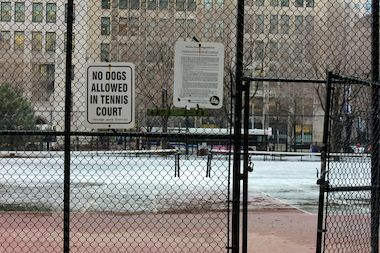 STREETERVILLE — After months of watching dogs run amok in Lake Shore Park's enclosed tennis courts — and their owners not cleaning up the poop the pooches left behind — the park's advisory council has voted to lock the gates to the court. At a meeting of the Lake Shore Park Advisory Council earlier this week, members and park security said the gates will be padlocked for the rest of the winter and for future winters at the park at Lake Shore Drive and Chicago Avenue. "It's not just the dogs leaving a mess," advisory council chairwoman Peggy Holst said. "The dog claws can damage the court surface, and the dogs can damage the net. It's not a dog area, and so I don't think we should have dogs on the tennis court." The tennis court will be locked for the rest of the winter and every winter moving forward after area residents raised concerns about dogs scratching up the court's surface and leaving waste. Before the vote, park supervisor Dan Puente said he had received clearance from park security to lock the tennis courts, which previously were kept unlocked year-round with the nets in place. There is a sign posted at the entrance banning dogs from the enclosure, but it is widely ignored, advisory council members said. Although Monday's warm weather brought many two- and four-legged Chicagoans to Lake Shore Park, the tennis court and surrounding pathway were still caked with ice. But there were reminders that dogs had been on the courts. "I went out there today, and it was pretty bad," Puente said. "A lot of people have not been picking up after their dogs, and it's definitely a nuisance. The tennis courts weren't damaged at all, but I think we're in agreement that we're going to lock the courts and shut them down for the season until the weather breaks, and then we'll keep them open for the season." Puente said Lake Shore Park staff hasn't determined when the court will be locked and unlocked in future seasons, but he said he would seek input from the advisory council. Gina Schwartz, who lives six blocks from the park and has a son in Park District programming, said she was glad to hear the court would be locked up. "I wouldn't want dogs on the tennis courts — there's no reason for them to be there," she said at Monday's meeting. "I don't even use the tennis courts, but I would be very offended if I went and they were there." But some dog owners at the meeting lamented the limited options for pups in the park and in the neighborhood in general. "If you don't want dogs on the court, then provide an alternative," said resident David Kostelansky. Holst said plans for a separate enclosure for dogs would be submitted with other requests for future renovations of the park.